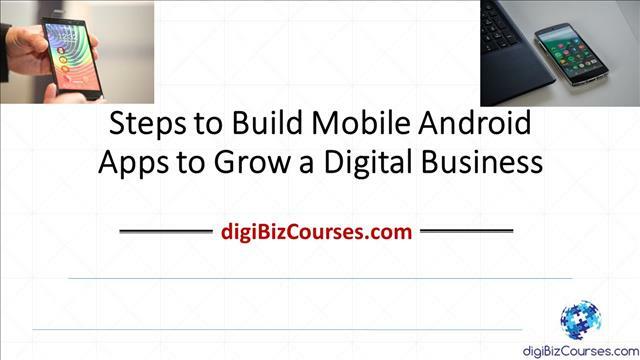 This video tutorial session covers the basic steps and the process needed to build and publish mobile Android Apps to grow ones digital business. This tutorial will focus more on the process rather than on the technical details. Before getting into the steps for building and publishing an Android App, let’s review some statistics related to the popularity of the mobile platform, especially related to the Android system. First, a note about mobile apps. Mobile apps as most of us know are software programs that run on mobile devices such as mobile phones, PDAs, wearables, and other mobile devices. The following provides basic information and statistics on the popularity of Android Apps. When it comes to the total population of the mobile phones, there are now more than 7 Billion phones worldwide and that number is constantly rising. Mobile, therefore, has become an essential computing platform that no one ignore. Android’s share of the global mobile market is now more than 80%. Android has come a long way since new apps started surfacing in 2008. This market share is constantly on the rise. There are currently more than 3 million apps on Google Play Store and again these are constantly increasing. When it comes to revenue, the overall App Economy’s revenue is expected to be around $150B by the year 2020. Some estimates have the economy reach in the trillions of dollars in a few years. These numbers therefore clearly indicate that there is a lot of economic activity at the consumer, business and governmental levels around mobile apps and this again is expected to increase. Most installed apps are in the category of Education, Business, Lifestyle, Personal, and entertainment. Apps are used for mobile banking, education, requesting business services and many other uses. There is potentially an app for everything these days. While many are free, there are others that charge for their use. 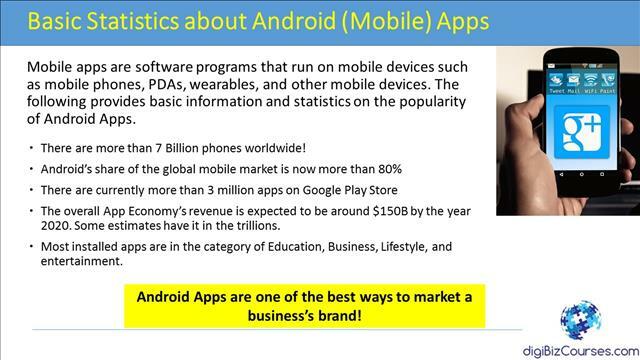 The bottom line is that Android Apps are one of the best ways to market a business’s brand! So, as a business, you should consider developing and publishing apps related to the products and services of your business, if you don’t already have one. 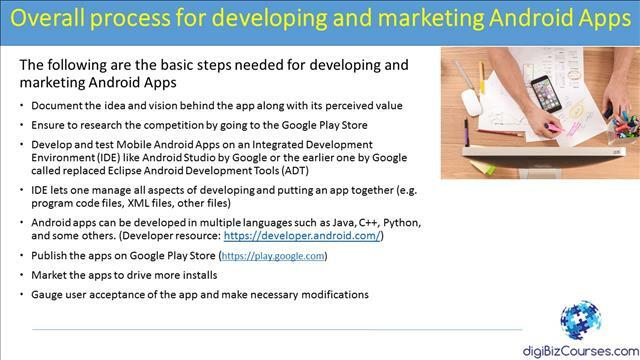 Let’s now review the overall process for developing and marketing Android Apps. The first step is to document the vision behind the app along with its perceived value. Documenting the vision and the value proposition will not only help you in clarifying various aspects of your idea but it can give you an opportunity to refine the idea over a period of time and also can give others who are reviewing your idea a clear picture of your thought process and provides them an opportunity to provide better feedback. Once you have done that, it’s important to research the market and the competition. There are millions of apps published already with many more being added daily. Therefore, it’s important to review their features as well as performance before starting to develop a new one. The next step is to Develop and test your Mobile Android Apps in an Integrated Development Environment (IDE) like Android Studio by Google or the earlier one by Google which was called Eclipse Android Development Tools (ADT). After the development and testing, the next step is to market the apps to drive more installs and usage. As part of your regular monitoring, it’s also important to gauge user acceptance and get feedback and then to make necessary modifications. Next, let’s look at one of the IDE or Integrated Development Environment for building Android Apps. It’s called Android Studio and is Google’s primary IDE for building Android apps. Let’s look at some of the characteristics of this IDE. 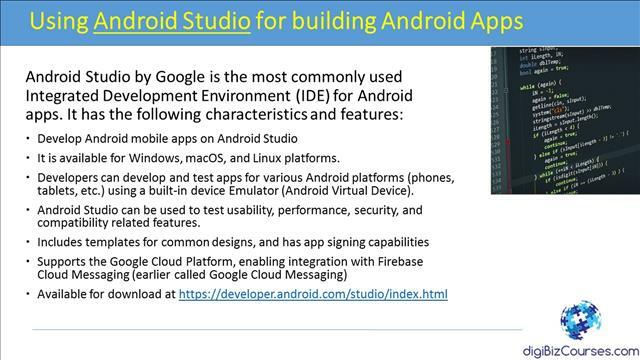 Android Studio is Google’s official and primary IDE for building Android apps and almost everyone uses this one. As we had covered earlier, the earlier one, also by Google, was called Eclipse Android Development Tools (ADT) but now Android Studio is being used as the primary tool. It is installed on a desktop and is available for Windows, macOS, and Linux platforms. Using Android Studio, developers can develop and test Android apps for various Android devices and platforms such as tablets, mobile phones, wearables, etc. As it has a built in device Emulator, you can also test for various types and models of devices. When testing in this IDE, you can not only test for functionality and features but also test for security, performance, and compatibility issues. The IDE also includes templates for common designs, and has app signing capabilities. It also has support for the Google Cloud Platform, which in turn enables the integration with Firebase Cloud Messaging (Firebase Cloud Messaging was earlier called Google Cloud Messaging). First, you have to sign-up for a Google Play Developer account at this link: (https://play.google.com/apps/publish/ There is a onetime $25 fee for this. 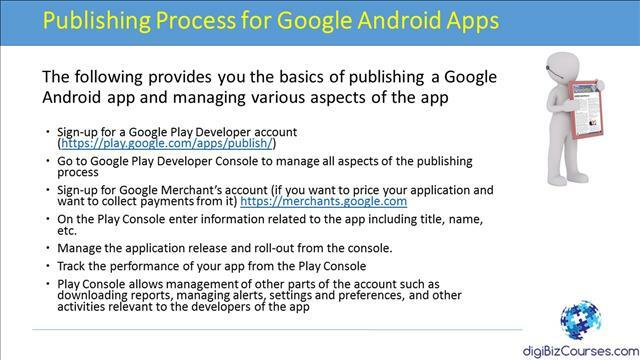 Once you have that account, you have to go to the Google Play Developer Console to manage all aspects of the publishing process. This includes deciding which countries you want the app to be distributed in, managing versions, etc. Once you are in the Google Developer Console, you have to include information related to your app such as title, name, description, etc. From this point on, you can manage various other aspects of the publishing process such as app releases and roll-outs, tracking the performance of the app once it’s published, downloading reports, monitoring and managing alerts related to the app itself, and many other activities. Again, all these activities are managed from one place through the Google Developer Console. Once an app is published, users can go to the Google Play Store to download and use it. However, given that there are hundreds of millions of apps out there in the marketplace, this usually requires promotion and marketing on your part as the app developer. 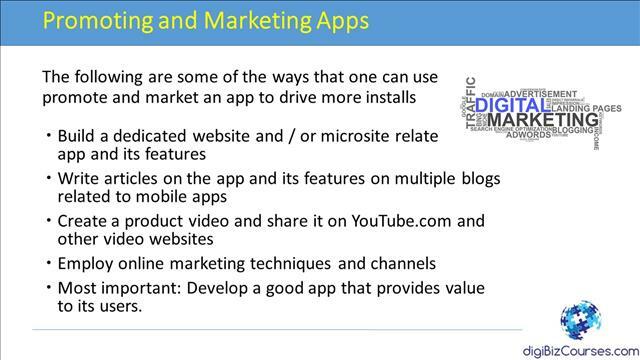 The following are some ways that app developers use to market and promote their apps. They build a dedicated website and / or microsite related to the app and its features. This provides a one stop place on the web where all information related to the app is available. Also, this ends up being as a separate channel from the Google Play Store where information on the app is available. This makes it accessible through search engines, etc. and makes it easier to market online. Another option is to create a product video and share it on YouTube.com and other video websites. This makes it accessible on another popular channel. As always, once the information about the app is published on multiple pages, etc. you can use regular online marketing techniques and channels such as Google Adwords, or other marketing platforms to market the app. Finally, the most important part of making an app popular is to develop a good app that provides value to its users. In that case, the app will have a viral effect and just like good content, it will be pushed by the online user community.